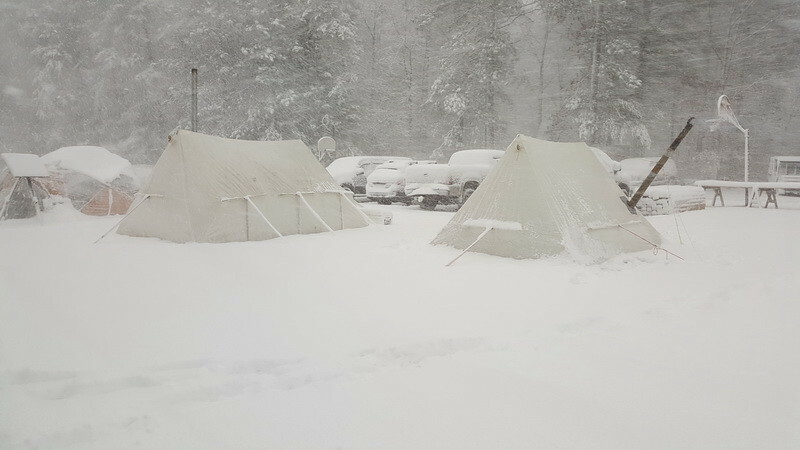 It was another great Winter Camping Symposium! I think the symposiums get better every year. 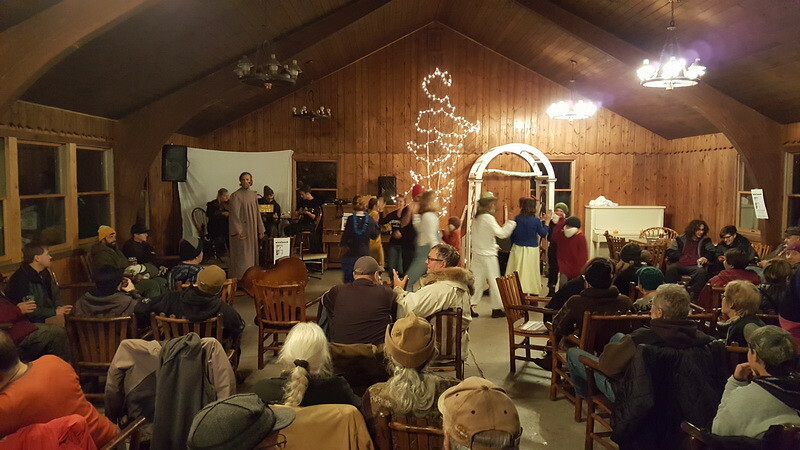 Congratulations once again to the organizers, volunteers, key note speakers, workshop presenters, seminar presenters, volunteers, presenters, and Camp Miller staff. 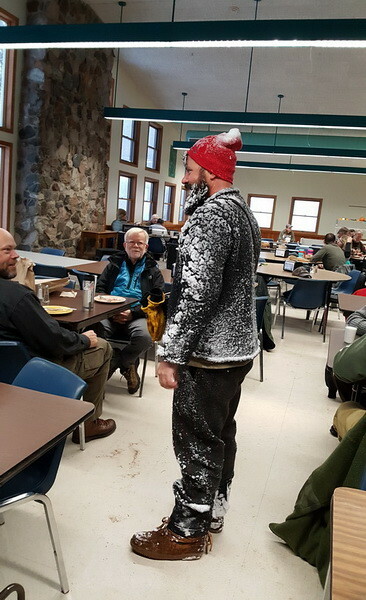 For the first time, the WCS got really snowed on. 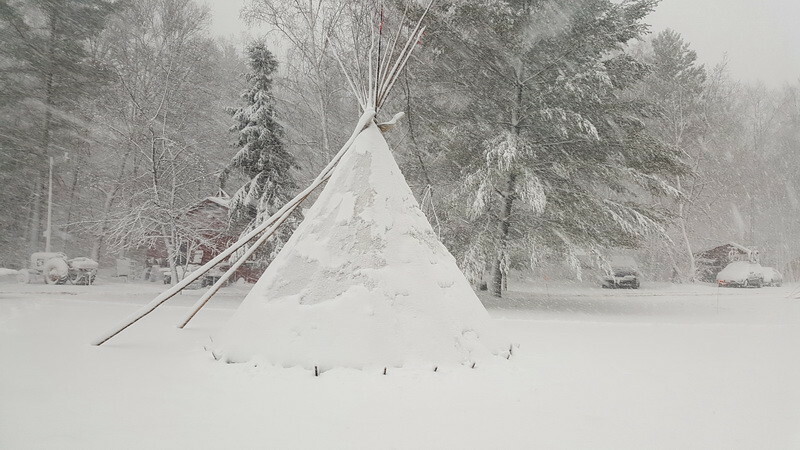 We received a good 4 inches of heavy wet snow Friday night and it stayed for the weekend. 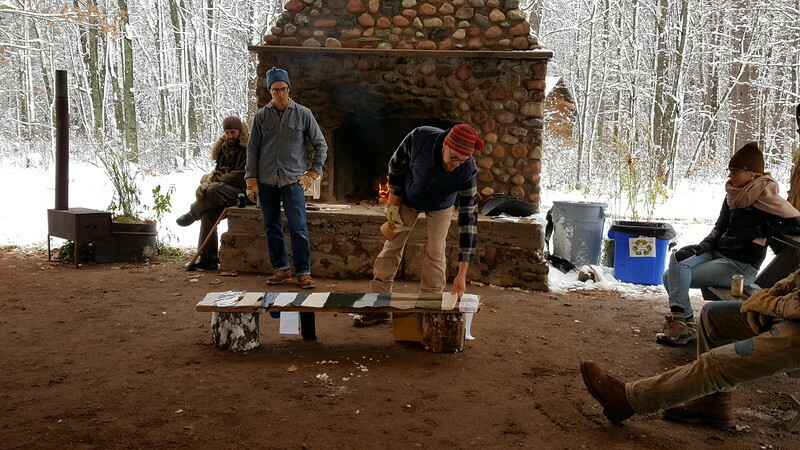 There was a good wood supply available of pine and oak to split with your axe, and all hot tenters, and the activity areas, had fire to stay warm and dry with. 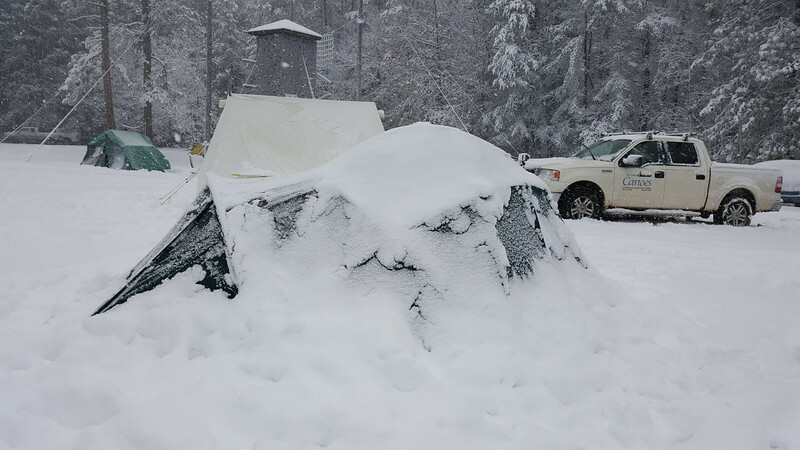 For those who have never attended, the location YMCA Camp Miller at Sturgeon Lake MN, is a big camp with many heated buildings to stay warm in should you not be hot tenting, so its no worries if you cold camp or day visit the event. A few photos I snapped while walking around the "tent city" after the big snowfall, and while attending seminars, or dropping in for a quick look at others, and some evening activities. These do not do justice to all the seminar and workshop presenters. Apologies that I missed photographing many of the vendor’s booths and tents, and it was impossible to photo everything going on all the time, so this in no way represents anywhere near the full spectrum of activities that were going on. My 8x9 Snowtrekker Friday morning after the big snow. 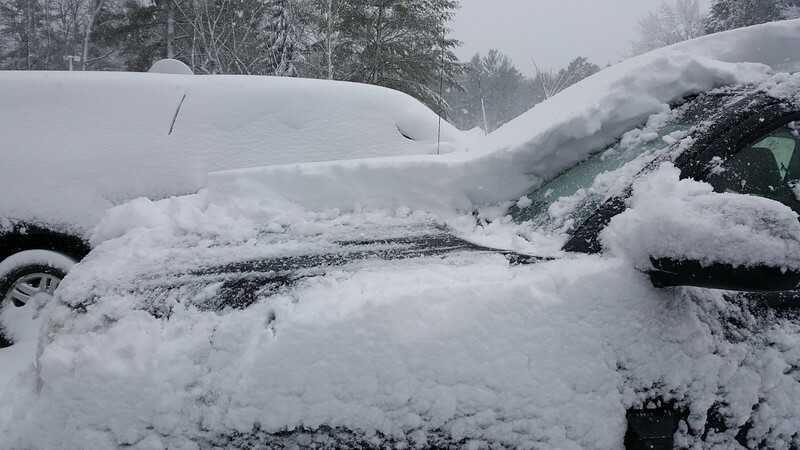 How much snow did we get? This is a cross section from the hood of my truck. My buddy Jim waves, signalling he survived and thrived. 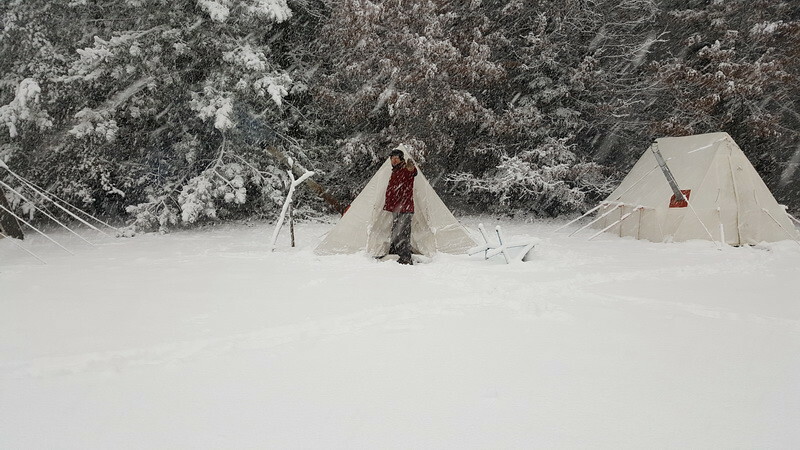 Bill always sets up and lives in his big tipi and dresses in fur trade period clothing, and is always happy to provide tipi tours and explain how the open fire works inside. Trevor and Mike's big Snowtrekkers, always welcoming for a drop in visit. Shovelling out. Snow shovels were in high demand! All shovelled out and ready for visitors. Some of the big tents brought by the well-prepared vendors. Shopping was dry and out of the wet snow. 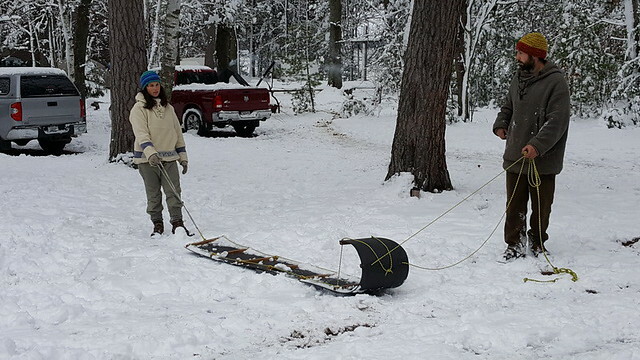 Long time supporter of this site, AWBrown, weathering the storm just fine in his Snowtrekker. A forest gnome wandered out of the bush and visited us after breakfast. Rob (Kaycee) and Lilani's awesome canvas camp. Beautifully set up large hot tent with awning and wind breaks. Very generous folks, always welcoming to visitors. 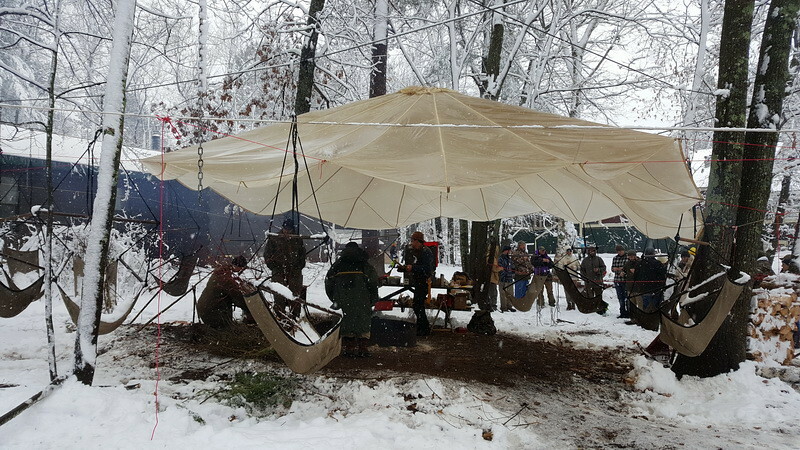 No matter what the weather, R&L live large under canvas, and always have the grill fired up with ongoing delicious hot meals and water for hot drinks. 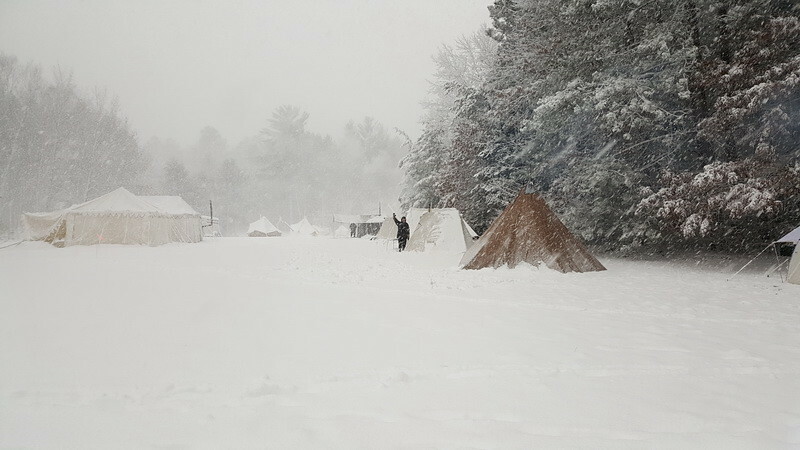 Touring the tent city, there are many designs, including several tipi hot tents. Don's unique DIY tent, that is incredibly ultra light for this size of hot tent. 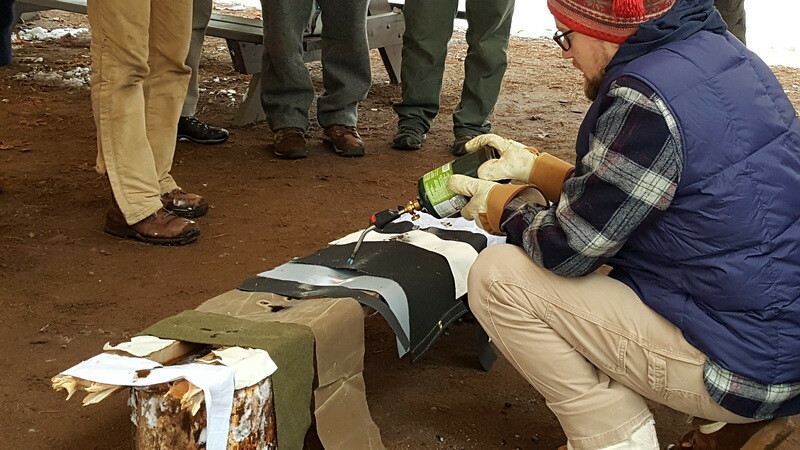 Don has also made a unique stove for this tent. Next time he is there, check it out, he is happy to show you the designs. 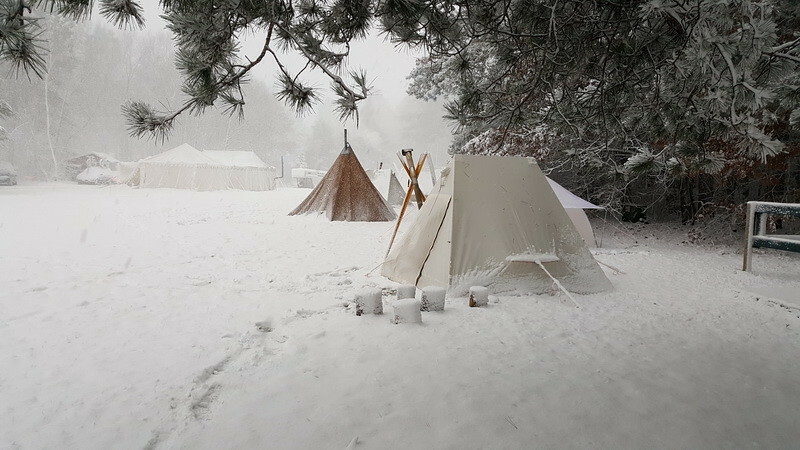 The cold tenters were well prepared, and weathered the storm. 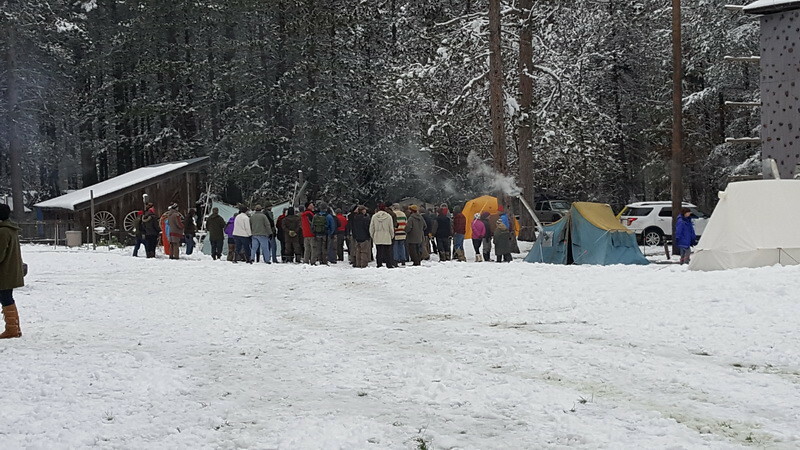 The main camp lodge is always open for warming up and chatting with folks, with hot coffee and water for tea throughout the day, and of course the meal plan for 3 square per day. And of course, the camp's comfort stations are heated. In addition, there is usually a big open fire going somewhere in the activity areas to warm up by. 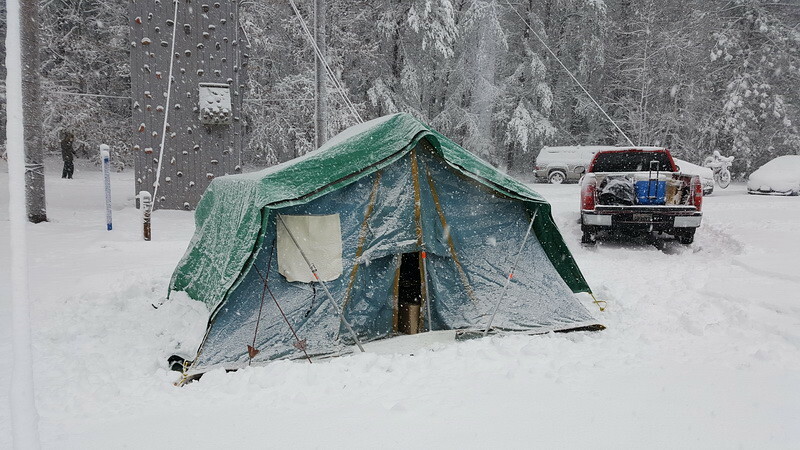 For those wanting indoor accommodations, the Camp has several cabins and rooms available. 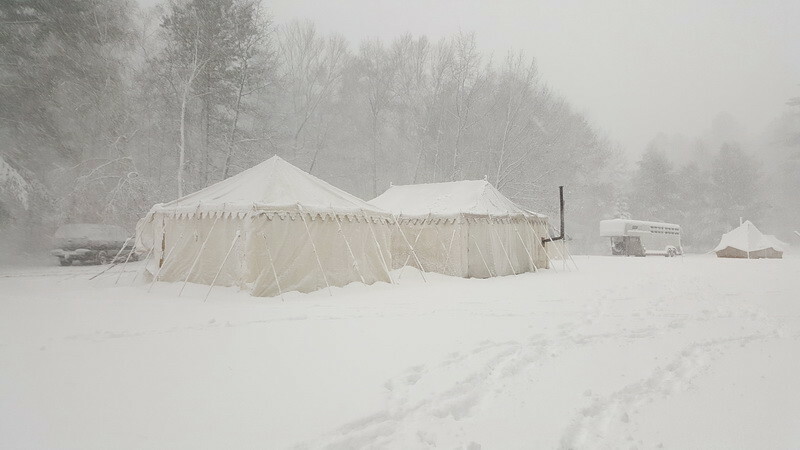 For the Do-It-Yourselfer's, the Tent City always has a wide assortment of tents designed and made from scratch, as well as commercial family type tents like this one modified for winter use. Use what you have and get out there! 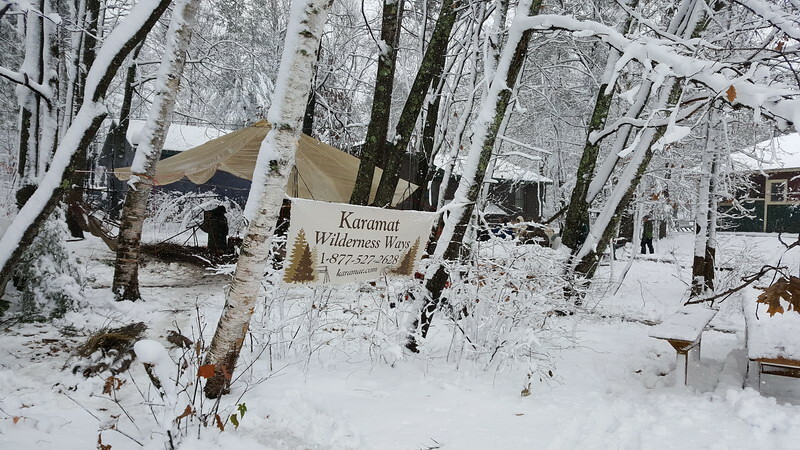 Karamat Wilderness Ways had an outdoor skills area set up with a parachute shelter and huge fire going in the center, which was a common gathering and warming place all weekend. The big central fire is sunk inside the steel container, and the steel also radiates heat. I took advantage of the warming opportunity several times throughout the weekend. 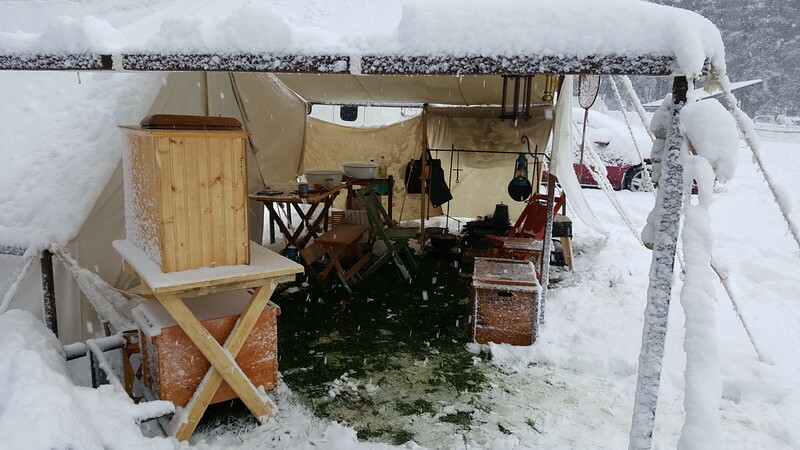 Kevin from Empire Wool and Canvas has a centrally located hot yurt, and it was always open for visitors, and to sit down and do a deal on Kevin's fantastic outdoor clothing selection. 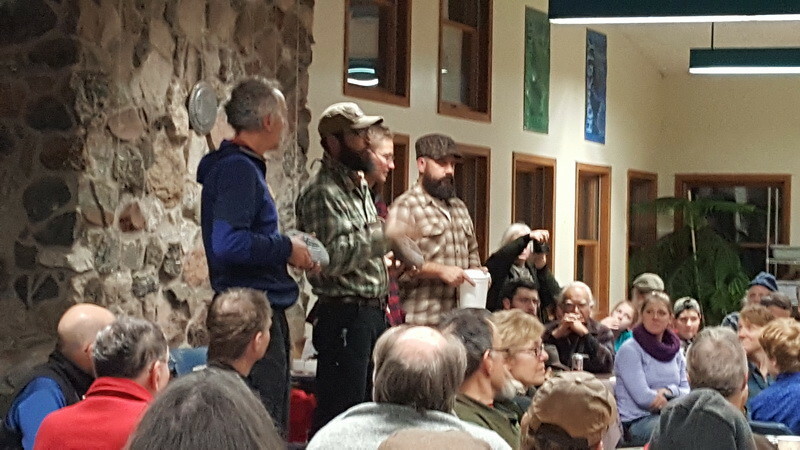 I attended the activity that Dave and Kielyn Marrone, of Lure of the North, presented, on "Efficient Portaging Techniques, or How to get those big brutes up and down hills without killing someone!" 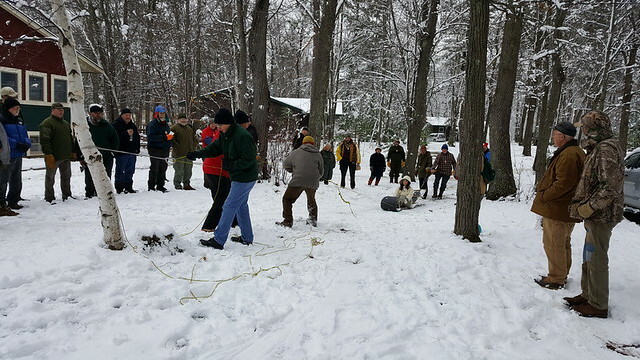 This was a thorough seminar on hill safety, ergonomics and efficiencies with multiple people and toboggans, and various rope techniques including brakes and mechanical advantage hauls. Kie and Dave on the intro, on a borrowed toboggan, showing the front haul line and rear brake and safety line. Starting simple with the brute force team haul method, using a munter hitch safety brake on the tree anchor. Kie is simulating sled top load, and two gravity helpers on the back pull line are simulating the downward gravitational force. A more complex method of a 4 times mechanical advantage haul utilizing carabiners and pulleys. Dave and Kie emphasized safety throughout this demonstration. All new skills for me, so I was taking notes and plan to improve my kit by adding the rope and hardware that Dave and Kie showed, and I need to practice these hauls in the bush. 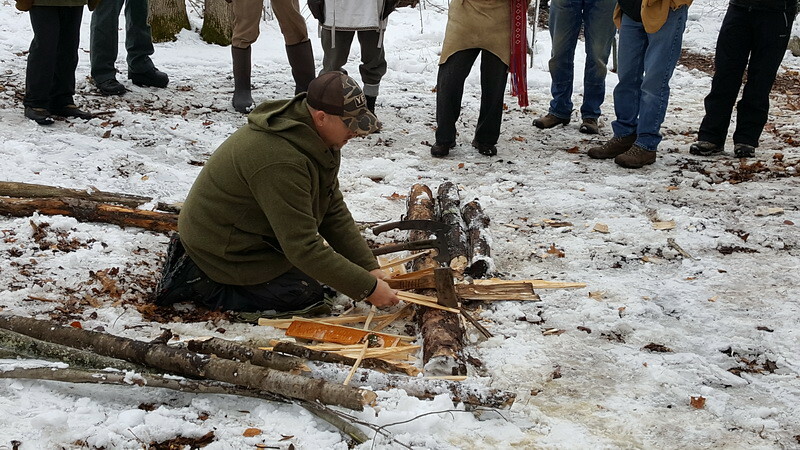 Jason of Lester River Bushcraft, demonstrating safe and efficient methods of splitting down rounds into kindling, using axe, hatchet, big and small knives. ....end of Part 1. Stay tuned for Part 2 shortly! 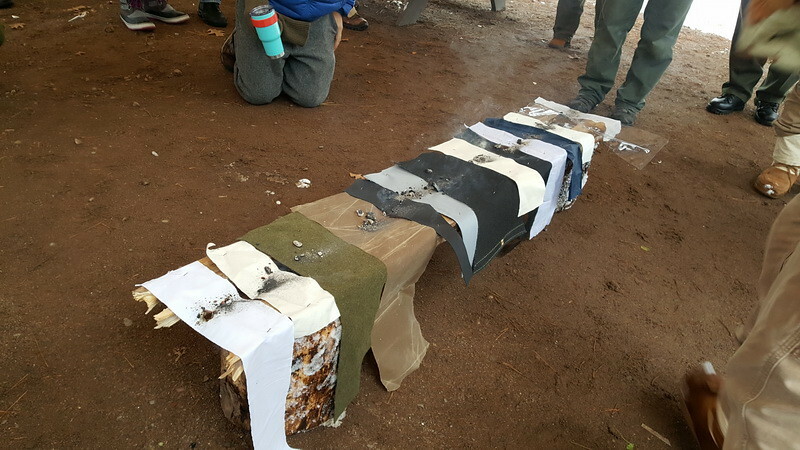 I attended Brian, Jon and Michael Maruska's seminar on fabric and fire. 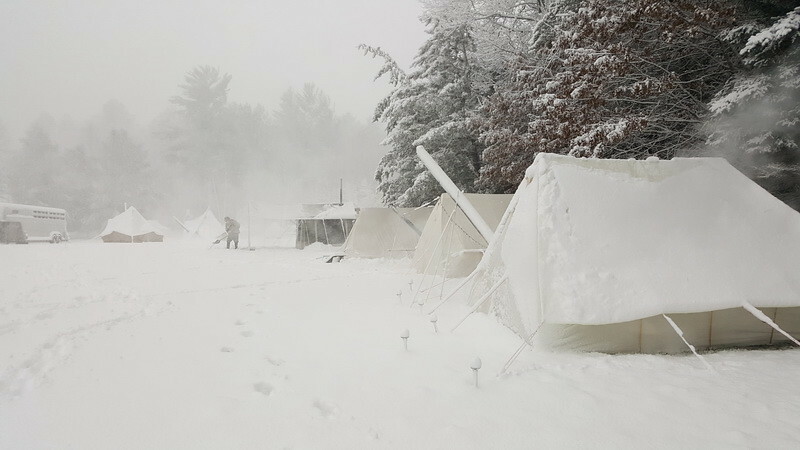 To my knowledge this is the first time the WCS has seen such a wide range of common tent and gear fabrics that tested for fire adjacency, coals, direct flame, and stove contact. Well done lads! They also provided some good background info on fire retardants and emerging research on health issues with these retardants. The untreated cotton ticking, second from left, burned up real good! The green blanket wool beside it resisted very well. No worries for sparks and embers hitting wool for short periods of time. The waxed canvas 4th from left also burned up real good! The direct flame test. 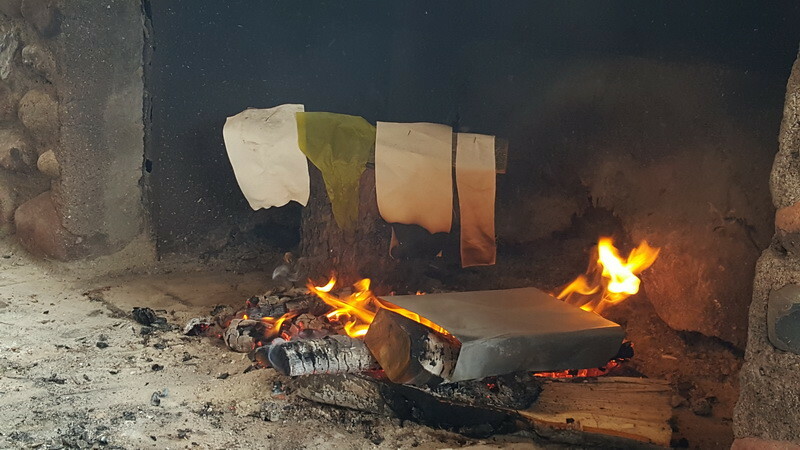 Interestingly, many of the fabrics with fire retardants did in fact resist very well before finally starting to singe, melt and burn. I was impressed with several fabrics resistance. OK, no longer fooling around, this is the propane torch test! 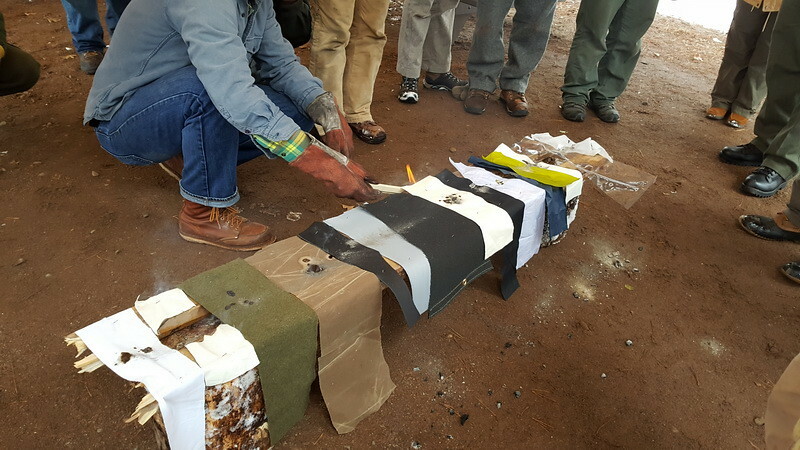 The gray fabric being torched is silicon impregnated stove jack fabric. The black fabric to its right is a fiberglass welding blanket material or some sort of other extremely heat resistant material. These resist the torch for a long time but eventually get brittle and burn through, but for a tent stove jack function or heat shield, they proved their worth for extreme heat resistance. And the stove contact test with various swatches. All burned eventually, but with varying lengths of resistance time. 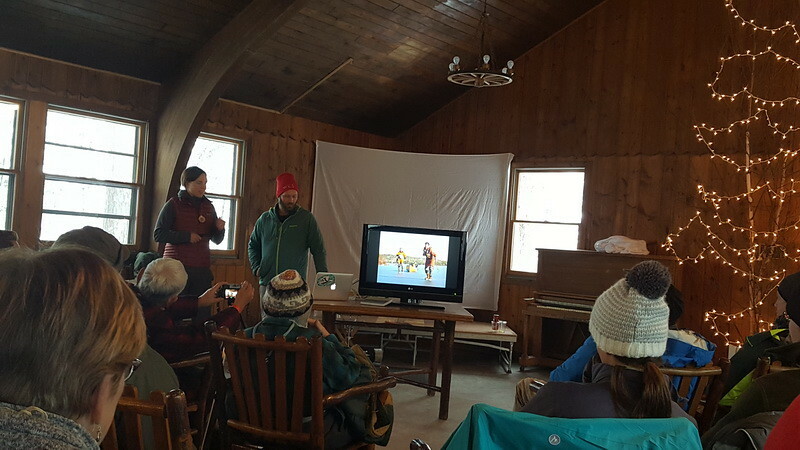 Dave and Amy Freeman presented a beautifully photographed seminar on travelling on ice, including using the canoe as a boat-sled combo to travel new ice, decaying ice, open water leads, all while wearing dry suits to travel the shoulder seasons. Awesomeness! 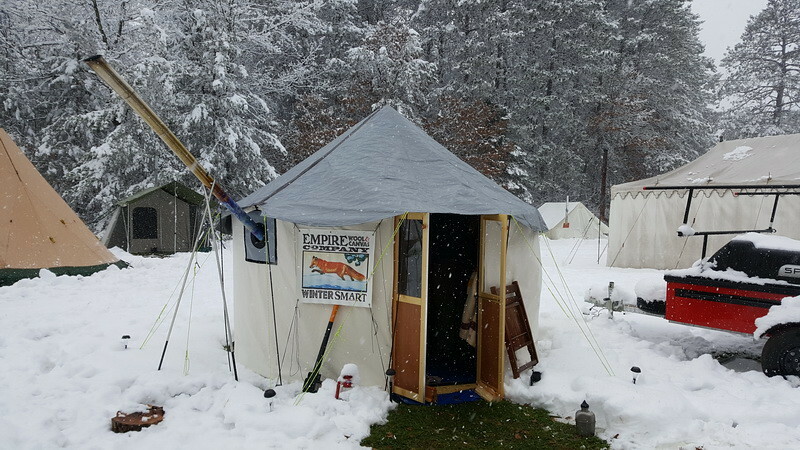 The annual and traditional tent tour, lead by Duane Lottig of Snowtrekker Tents, and Kevin Kinney of Empire Wool and Canvas. They pick a cross section of designs around the grounds to visit, and the owners of each tent participate in discussing their unique designs. Cooke Custom Sewing products, always with some good symposium deals. 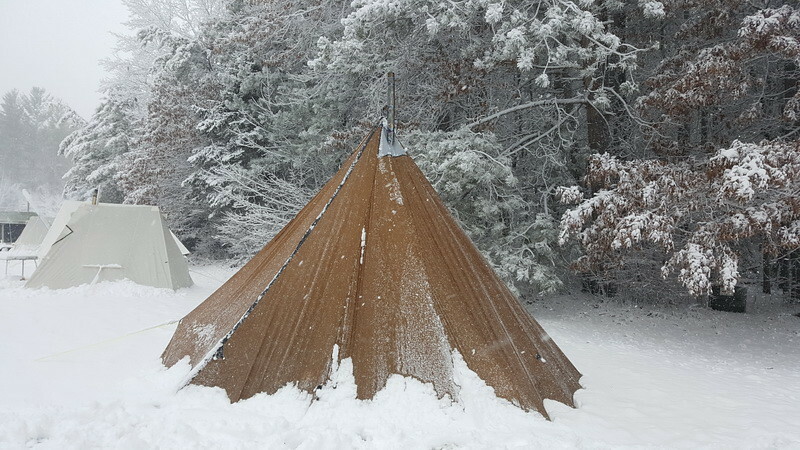 Dan's iconic green and white nylon tipi-wall tent. 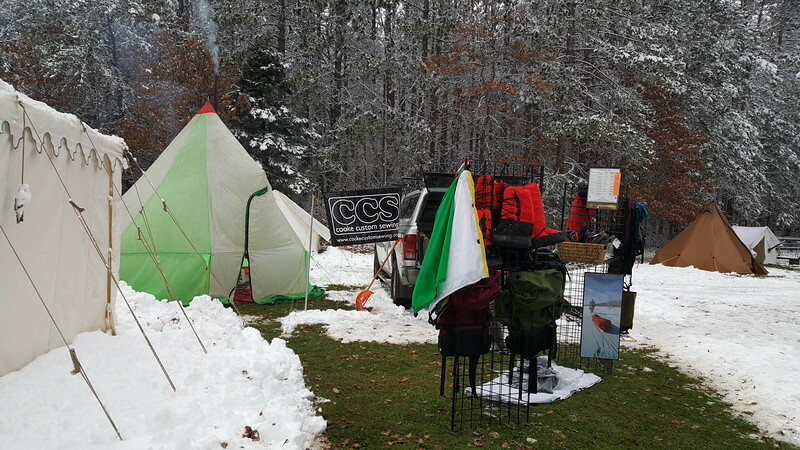 Dan also does a CCS tarp set-up demonstration, showing several versatile tarp configurations for wind and weather. When I saw this cool new "Bush Roots Axe" logo from Ben's Backwoods, as an axe guy myself, I had to have something with that logo. 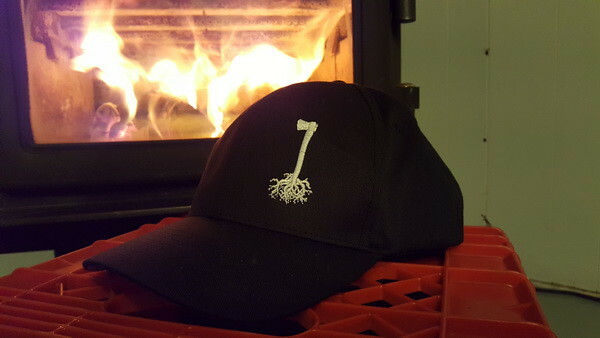 I bough this hat, and Ben sells this logo on T's and sweatshirts. Apologies to all the vendors who I missed without snapping photos. I was so busy checking out the awesome gear I forgot to take more photos! There is an amazing scope and breadth of outdoor gear and clothing available here. Clothing, toboggans, knives, axes, pouches, bags, fire kit, sharpeners, snowshoes, etc, as well as a silent auction of lots of used gear. If you need to outfit yourself, and looking for gifts, you can accomplish that at the WCS. Saturday evening is event-rich. After dinner, there is a big door prize give away of many gear items. MC's are the 4 amigos: Chris, Ryan, Kevin and Matt, also organizers of the event, along with many people behind the scenes. Thanks to you folks for another very well run WCS! 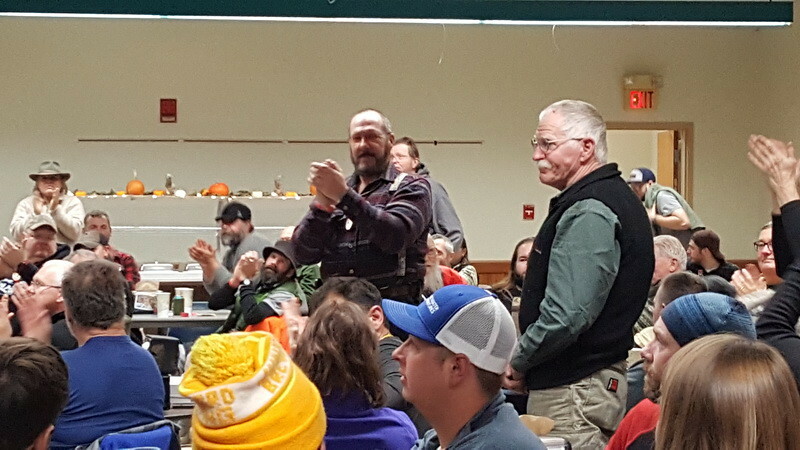 Two special life time achievement awards were presented to long time core supporters of the Symposium, and innovators in their field who have revolutionized the modern traditional winter camping movement : Don Kevilus of Four Dog Stove, and Duane Lottig of Snowtrekker Tents. Duane, and life/business partner Margot looking up from left. 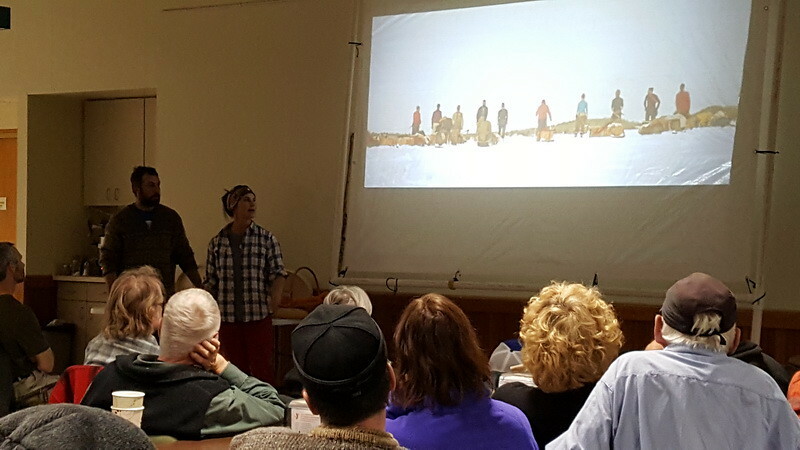 The keynote on Saturday night was presented by Dave and Kielyn Maronne from Lure of the North, https://lureofthenorth.com/ The presentation highlighted winter trekking through the beautiful imagery from the winter landscape of the Temagami area in northern Ontario. I think this presentation motivated everyone to start planning their next winter trips right away. Saturday night is always a party, with band. Local band “4 mile portage” played music, and there were several, including the band, in Halloween garb. Beer was flowing from the kegs provided by Duluth’s Bent Paddle Brewing Co. Outside the campfire was roaring with good company. 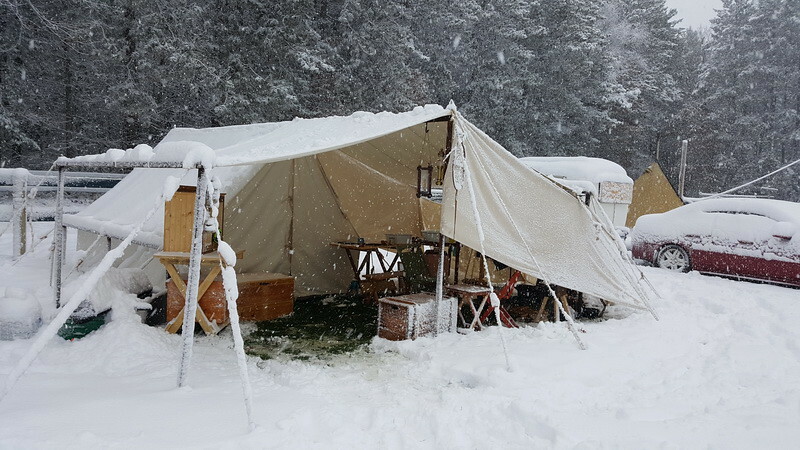 Man that is amazing, I would of loved to have attended that symposium, would have been cool to see people's different camp systems that they use, there's one thing being on this forum and picking up info, but to have physicaly been there and talk with individuals and get their take on snowcamping, maybe I will try for next years symposium. It almost seems CRUEL to taunt the rest of us with so much 'goodness' going on in one location and so many interesting people as well...well done! 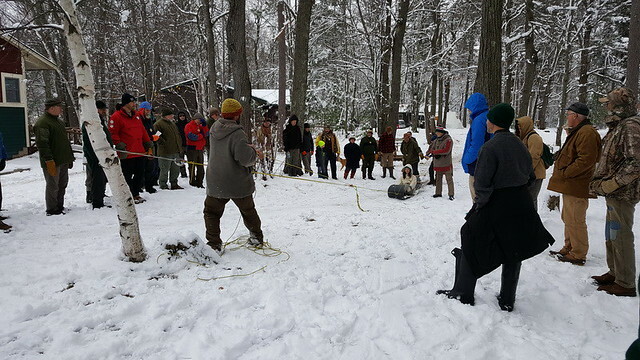 I look forward to the Symposium every year and it was one of the most memorable years yet, with the blanket of snow. Having the snow was a blast and none of us will ever forget this one. Wishing I could have found time to attend this year. It is difficult taking days off work at this time of year when we are busy trying to complete tasks before winter. Looks like it was a fantastic event. Great report and l love all the photos. Too bad this is so far away from central NYS. Hopefully retirement will eventually come around and I can have the time to drive out without having to worry about being back at a particular date and time. Great Photos HOOP, one question, what fabric did the best in the tests? Maybe one natural and one synthetic! Don't let distance keep you from attending. Our farthest attendee's came from as far away as Japan, Vancouver and Seattle, Washington. Hi ANDN! There were so many fabrics and tests I forget exactly. Its also complicated by the fire retardants applied. A fabric used for tents will have a different chemical applied than one not used for tents, due to the regulation. Clothing fabric may have another chemical retardant. Michael and Jon did the research and explained it well, but I forget the specifics. I seem to recall that one of their light fabrics was specially treated for very high fire resistance, but I can't recall if it was the best, nor if it was a natural blend or synthetic? If I recall correctly, the green blanket wool did extremely well with the coal test, as we would expect. I don't know if that wool was treated, but I seem to remember M or J mentioning that processed woven wool is naturally fire resistant. The silnylon did surprisingly well. Eventually it melts, and under the direct flame test, it will eventually start burning with a flame, but I was surprised at how long it resisted. 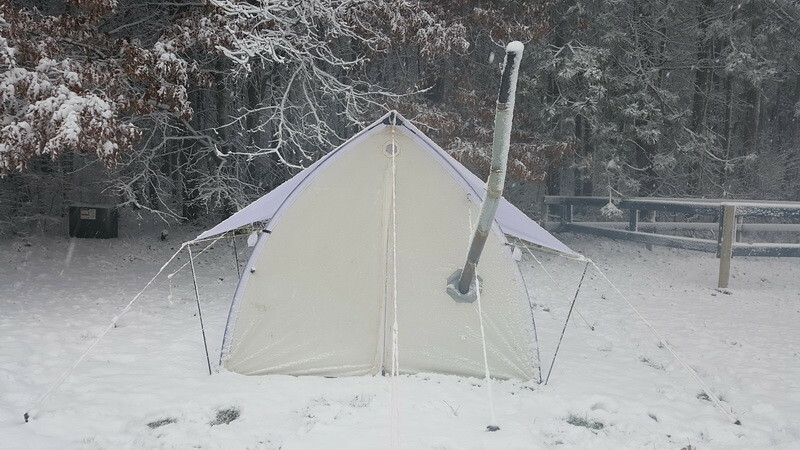 For treated tent cotton they tested a 10 oz sunforger canvas, and it performed very well as expected, resisting the coals and direct flame reasonably well. I don't recall a 6 or 7 oz sunforger being tested, but my memory fails. Another surprise was the tent clear window vinyl material for both the open flame and coal test. I would have guessed instant burn hole from a coal, but no, it resisted fairly well, maybe because it is a thick material and can absorb and transfer some heat away. Every fabric burned rather fast on the stove top simulation, but it may have been a hotter surface than a real stove, because that sheet metal was actually in the fire, without cooler air around it, so it may have represented a stove edging into the red hot surface temperature zone, instead of a toast yer bagel level of heat. 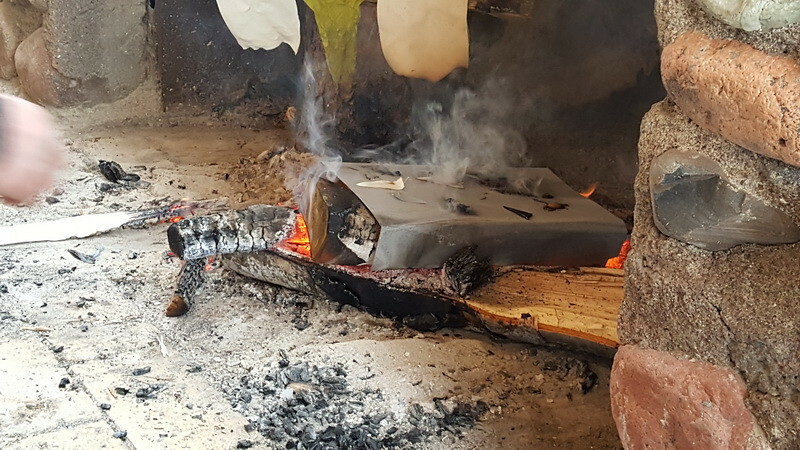 Once the synthetic fabrics, and natural cotton fabrics treated with retardants started smoldering and burning, with all those petrol-chemical fumes and fire retardant toxic fumes, I had to back away for fresh air because it was acrid smoke. 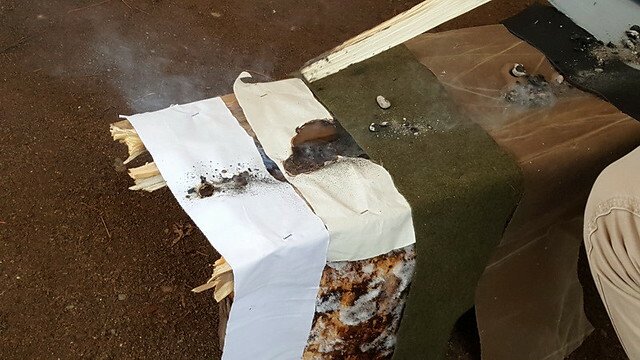 Lesson: don't breathe the air around your burning clothing and tent! I did not take notes on all the different fabrics, so I am at a loss. 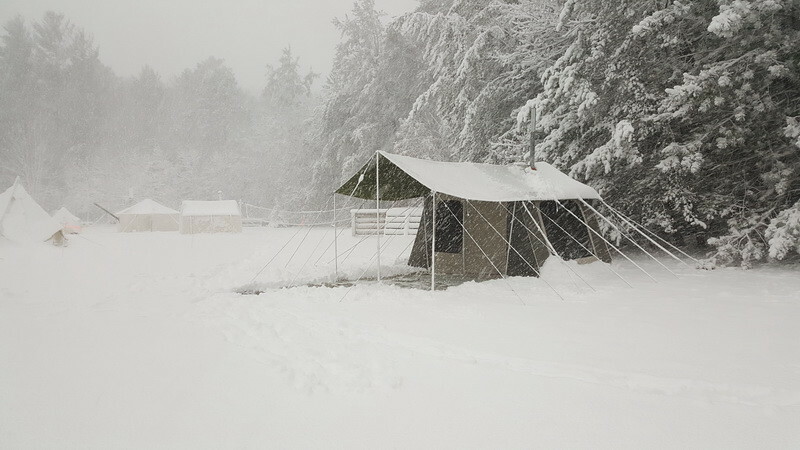 Overall I recall thinking that if someone could invent an ultralight wool tent fabric that repels water, is light, folds down very small, then that would be the miracle fabric we have all been dreaming of, and no nasty chemical fire retardant treatment would be necessary. Somehow I think ultralight tent-grade miracle wool is a ways off yet in the R&D department. Thanks for the great report Hoop. Glad to have you at the event, as always. Already planning for our 20th anniversary event next year!! Thanks to all of the wintertrekking community for all the support!